It is now two and a half away from May 2009, the month in which Suunto introduced its latest new creation … the collection Elementum. A line of models (Terra, Ventus and Aqua) rated the outdoors, sailing and diving, with a premium variation, emphasized by the use of quality materials for the case (316L) and crystal (sapphire, scratch-resistant). After having delighted with Elementum, and a vast number of special editions of the Core (the various limited edition, new colors and layout of the rings) and new versions (heart rate – HR) and the now legendary Vector colors (orange and red, which were added to the classic black, x-black, foliage green and yellow), the Finnish house really seemed to have perched on his laurels, leaving fans of his products fast real news for a long (perhaps too) period, while other brands continued to propose new tools and performance for athletes. Within a short time, even several of its models (some of which have, in fact, never found the hoped-for success among the public) have even fallen into oblivion, as the Observer, the X9 and 10, literally obscured by the domain of the Core, which has found a second youth (and deserved success) after the resolution of the famous “battery bug” that has plagued him in his youth (until 2009). 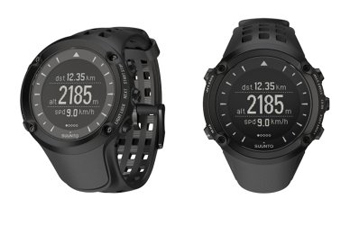 Unexpectedly, a few days, have circulated the first news on the upcoming presentation of a completely new model home Suunto: the Ambit. As leaked, more or less officially, from the Finnish, the scope will be a revolutionary product of its kind that combines within itself features until now never present (much desired) on the same Suunto, or those of ABC (altimeter , barometer and compass) and GPS, now available only sull’X10.